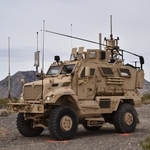 The U.S. Army conducted a month-long testing effort for the new Electronic Warfare Tactical Vehicle at the National Training Center at Fort Irwin in California, the Army said Monday. The 3rd Armored Brigade Combat Team or “Greywolf” commenced an electronic attack and support activities in an austere setting last month as part of the evaluation. Sgt. First Class Cristian Holguin, team leader for the EWTV effort, said the brigade facilitated communications jamming activities and heard enemy FM communications while detecting electronic signatures from adversaries during the exercise. Holguin noted that the NTC is working to improve performance measurement for the vehicle to accommodate real-time metrics and sensor data. The EWTV was designed by the Army’s Rapid Equipping Force unit to handle, detect and attack functions within the electromagnetic spectrum. 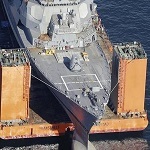 The vehicle is slated to be deployed to other units for testing and further development.